As both Peter Sagan (Tinkoff) and Michal Kwiatkowski (Team Sky) held off the chasing elite group, most everyone assumed that Kwiatkowski wouldn't have a prayer of beating Sagan in a sprint for the line. However, the sly Polish rider managed to force Sagan onto the front as they came within 700 meters of the finish. With those behind closing swiftly, the pair had little time to play cat and mouse. As Sagan looked back over his left shoulder to see where the chasers were, Kwiatkowski jumped on his right side. Before the World Champion noticed the attack, he was already four of five bike lengths behind his adversary. Sagan never got close to Kwiatkowski again, finishing in second place yet again. While much has been made of the curse of the Rainbow Jersey, Sagan is doing extremely well despite not claiming the top step of the podium, at least he is almost always on the second step. This is a small original watercolor and ink painting that was created using Yarka St. Petersburg watercolors and Steve Quiller brushes from www.richesonart.com. This painting is available through my artist website at www.greigleach.com. To purchase this particular painting, just follow the direct link at the end of this post. 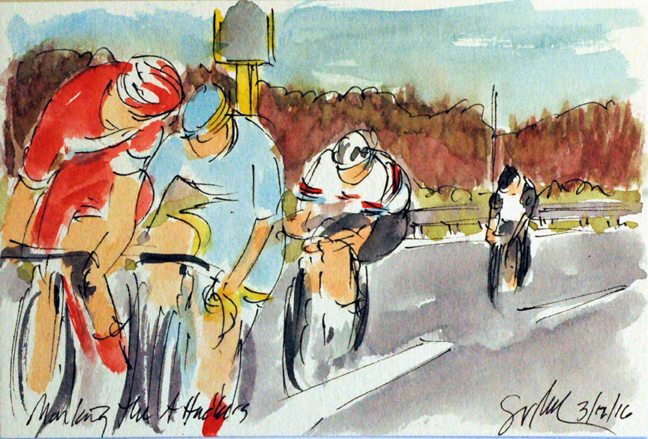 Plus you can see my most recent book at www.artofcycling.bike. It contains my writings and paintings of the 2015 Road World Championships in Richmond, VA. It is available through out the world from many different online booksellers or ask your favorite bookstore to order it for you. Using the climb up Karnemelbeekstraat, the reigning World Champion, Peter Sagan (Tinkoff) found himself off of the front of the race with the former World Champion, Michal Kwiatkowski (Team Sky), Kwiatkowski was showing off his new team kit, and both riders have the rainbow stripes on their sleeves (an honor only a former World Champion has earned). Given the pedigree of these two riders, it was unlikely that those behind would see this duo again, even if another former World Champion was amongst those behind. 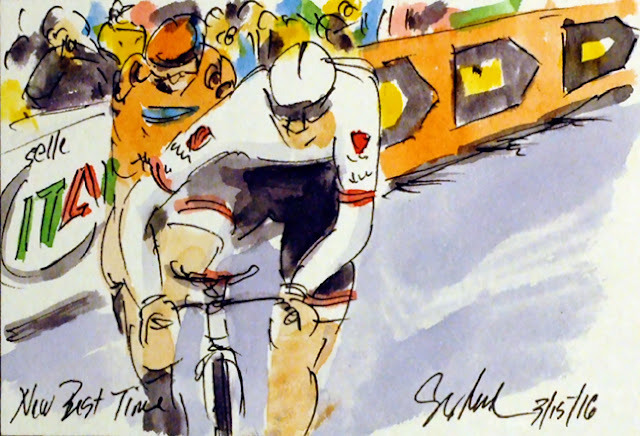 It was truly exciting to watch Fabian Cancellara (Trek-Segafredo) turn what should have been a day over mechanical issue into a show of talent, experience and strength. Cancellara had lost over three minutes waiting for his team car, and yet was able to use his team and his frustration to chase down the Etixx-Quickstep dominated second group on the road. 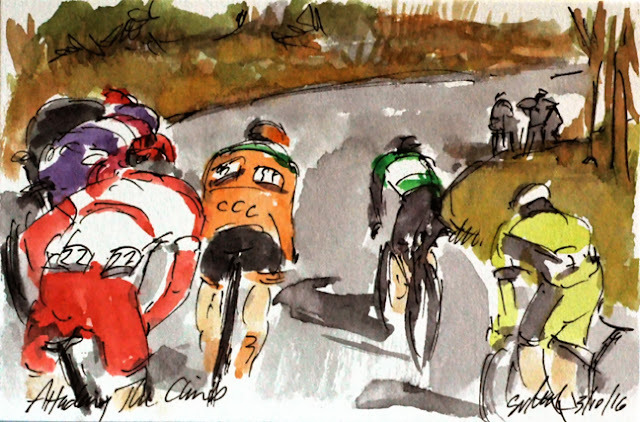 Using the climb up the Paterberg to close the final seconds to the group that contained, Lars Boon (Astana), World Champion, Peter Sagan (Tinkoff) and Dutch Champion Niki Terpstra (Etixx-Quickstep). Once they had all made the climb, they took the opportunity to grab a drink or a bite to eat before setting off again after the break away that was still up the road. Using the cobbled climb of the Taaienberg, several riders managed to gap the peloton. Etixx-Quickstep managed to put three riders into the group including Niki Terpstra, Tom Boonen and Matteo Trentin. Joining them was Fabian Cancellara (Trek-Segafredo) and Daniel Oss (BMC). Gesturing to all who would listen was Lars Boom (Astana), He seemed to be pointing out that Etixx-Quickstep had the numbers so they better do the work. Shortly after I painted this, my man, Cancellara, had a mechanical and had to wait a long time for his team car to arrive with a new bike for the former Swiss champion. After a few minutes of silence for the victims of the terrorist bombings in Brussels, the race got underway. Shortly thereafter, this group got off of the front and built up over five minutes on the peloton. 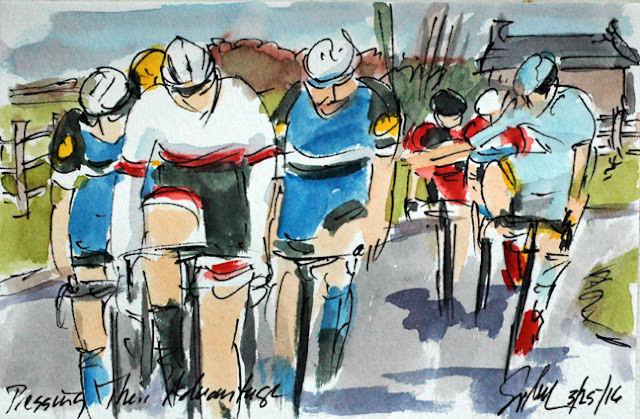 So as they wove through the sharp corners and narrow roads of Belgium, they were leading everyone around the race course. Some of those in the break included, Bert De Backer (Giant-Alpecin), Wouter Wippert (Cannondale) and Reto Hollenstein (IAM Cycling), all eight were hoping they could surprise those behind, many of home have claim victory in this race in the past. Filippo Pozzato (Southeast-Venezuela) a former winner of this race, had troubles on the climb up Oude Kruisberg. 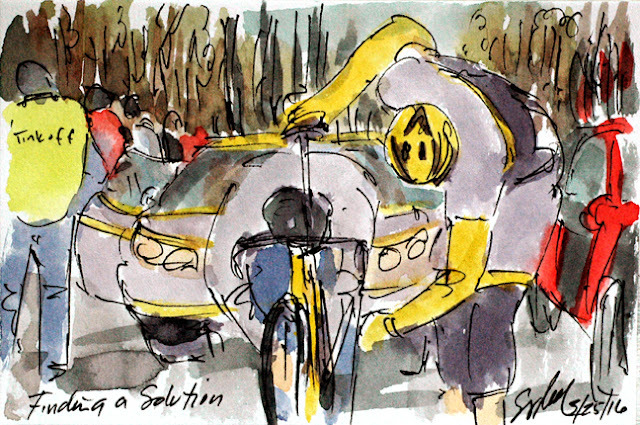 Unsure what the problem was, his mechanic joined him at the summit of the climb with a wheel and a tweak of the gearing. After a very quick change, Pozzato was swiftly back underway, using the following caravan to weave his way back into the peloton. Later, he could be seen reaching to his rear brake caliber to make a final adjustment before getting on with the business of trying to repeat a victory at day's end. Arnaud Demare (FDJ) had just cause to celebrate this victory, not only had he won Milano-San Remo by several bike lengths, he had done so after being on the ground with just 25 kilometers left to race. 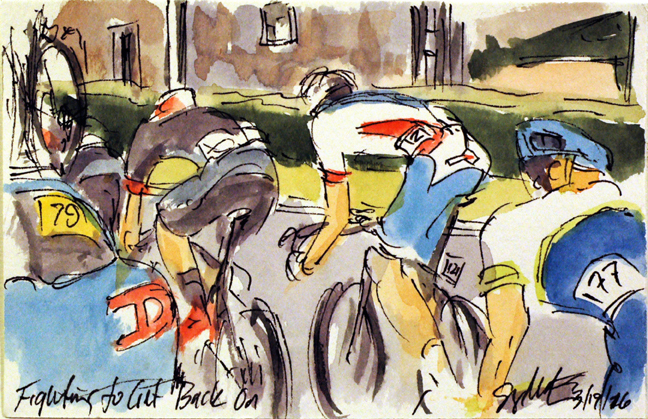 It to herculean effort to get back to the peloton and then all the way up to the business end of affairs. 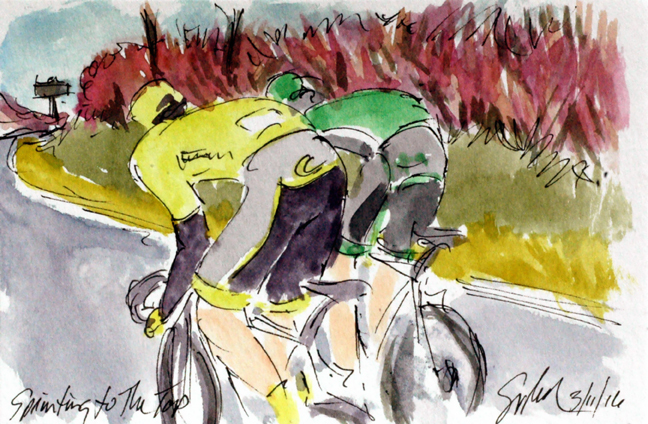 He was able to hold off Ian Stannard (Sky) who was the only one who could come close to matching the Frenchman's speed to the line. Just missing the podium was Greg Van Avermaet (BMC) and pounding his handle bars was fellow Frenchman, Nacer Bouhanni (Cofidis) who surely preferred to have been taking the race for France. This is a small original watercolor that was created using Yarka St. Petersburg watecolors and Steve Quiller brushes from www.richesonart.com. In addition, the painting is available through my artist website at www.greigleach.com. The painting is available for sale and can be found by following the direct link at the end of this post. 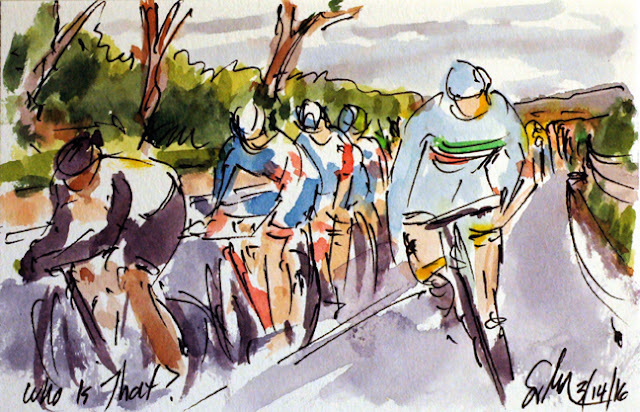 Be sure to check out my newest cycling book, Art of Cycling: Richmond 2015 UCI Road World Championships. 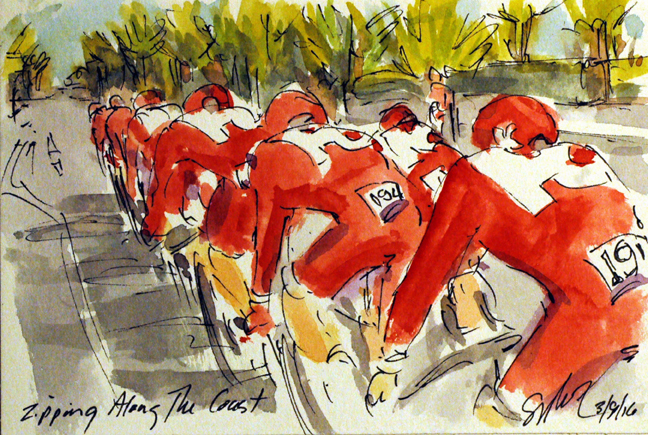 The book is available through your favorite book seller worldwide or at my publishers website, www.artofcycling.bike. Edvald Boasson Hagen (Dimension Data) looked over his shoulder to get a feel of who was behind him, and how they may sprint. Boasson Hagen had gone of the front with a small group that included Greg Van Avermaet (BMC), Fernando Gaviria Rendon (Etixx Quickstep) and had hoped they would stay away. They had already sped pass Ian Stannard (Team Sky) and Giovanni Visconti (Movistar), so he was right to be full of hope for the race. He may well have lost that feeling of hope seeing the peloton coming up behind with just 500 meters left to the line. Unfortunately for Gaviria Rendon, he went down just after I painted this image, ruining his chances for a win in San Remo. With the peloton catching the last of the early escapees on the lower slopes of the Cipressa (the penultimate climb of the day), it was time for the opportunists to try and surprise the others. The first to jump free of the rather large peloton was Giovanni Visconti (Movistar). 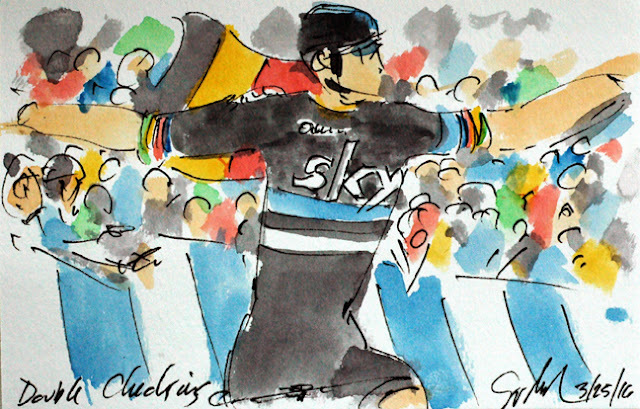 Visconti's move was quickly covered by Ian Stannard (Sky). The two opened up a quick 15 seconds on those behind. They worked together all the way to the top where Stannard led the Italian down the fast, twisting descent. I couldn't help put notice the bright orange pads that lined most of the corners on the way down. It was a little distressing to watch one of the men riding for FDJ slam into the pad. Comforting to know that the pad did the job it was designed for, as he jumped back on his bike and continued racing. As fatigue set in, and the nerves began to fray, riders began to hit the deck, crashing from touches of wheels or momentary lapses of attention. One of those to hit the deck was the former French champion, Armaud Demare (FDJ). Demare joined with Gregor Muhlberger (Bora-Argon 18), one of Muhlberger's teammates, and Luka Mezgec (Orica-GreenEdge) in the dash to race back up to the peloton. Demare was more fortunate than some who crashed. 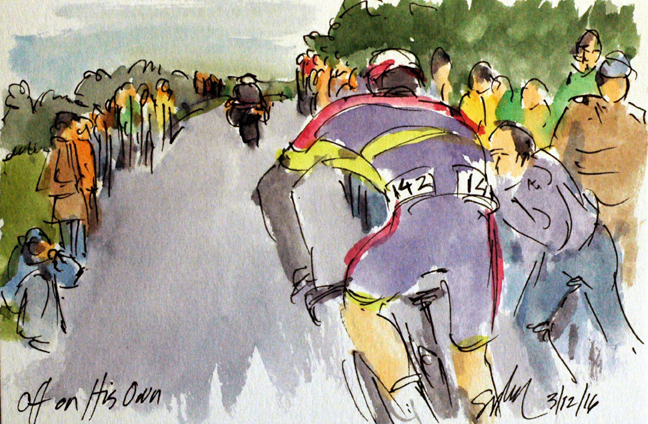 First he was able to get back up on his bike, while others were not able to continue, and he was also able to catch back onto the rear of the peloton. In so doing, he was still able to harbor hopes of playing in the finale of the race in about 25 kilometers. 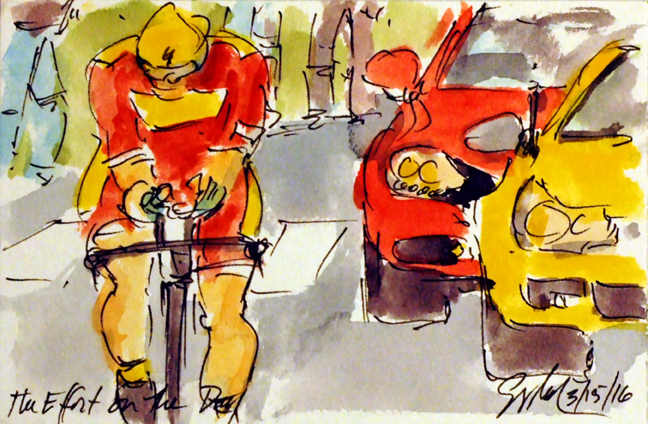 The early break was still off the front of the peloton, although their numbers had dropped somewhat. As Marco Coledan (Trek-Segafredo) led Mirco Maestri (Bardiani CSF), Maarten Tjallingii (Lotto Jumbo NL) and Jan Barta (Bora-Argon 18) up the final of the three Copas that mark the final phase of the race to San Remo, the Copa Berta. The course along the Mediterranean Sea offer beauty vistas as the road wound around the steep hills that plunged into the beautiful azure sea. 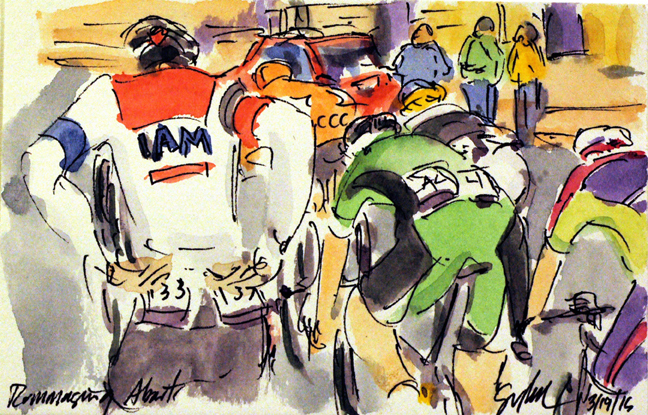 Roger Kluge (IAM Cycling) one of the twelve men in the early break, rummaged through his pockets looking for more food. With such a long race, it was important to keep topped up from energy, lest they fade away on the final climb of the day. Some of those joining Kluge were, Mirco Maestri (Bardiani CSF), Matteo Bono (Lampre-Merida), Samuele Conti (Southeast Venezuela) and Adrian Hankisz (CCC Sprandi). Milano San Remo is a very long race, made longer this year by a rock slide that closed off part of the planned course. The rerouting added another 9 kilometers to the stage, making the total kilometers cover while racing 300 with another 7 K of the neutral start in the city of Milano. With that many kilometers of road to cover, flats, mechanicals and even crashes were inevitable. Mark Cavendish Dimension Data), sporting his new team's kit, was brought back to the back of the peloton by his teammate Serge Pauwels. Given his past victory in the race, the TV Moto was sure to cover every move the sprinter made. Notice that the camera operator is standing on the back of the motorcycle while filming, with his other hand firmly grasping a pole on the back of the bike. Would you like to see how I painted this painting? Watch this time lapse film clip of this piece being made on You Tube by following this link. 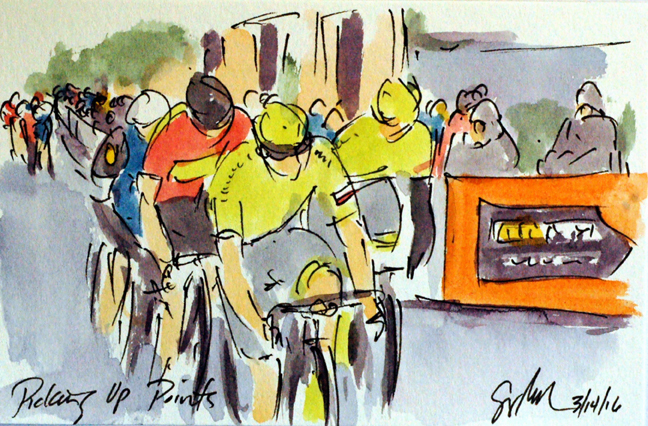 The announcers for Eurosport, Carlton Kirby and Daniel Lloyd felt that the stage and therefore the race could go to either Peter Sagan (Tinkoff) or Greg Van Avermaet (BMC) depending on the "effort of the day." Sagan certainly put everything he had into the day and managed to move himself up from third overall into second. But that elusive first place finish still seems to be just out of his reach, but then he has been here before last season but ended it by winning the World Championships in Richmond, VA. He did manage to keep the Maglia Rosso of the points leader, but the Maglia Azzuro of overall winner went to Greg Van Avermaet. This is a small original watercolor and ink painting that was created using Yarka St. Petersburg watecolors and Steve Quiller brushes both from www.richesonart.com. In addition, this painting is available from my artist website at www.greigleach.com. To purchase this original work of art, just follow the direct link at the end of this post. 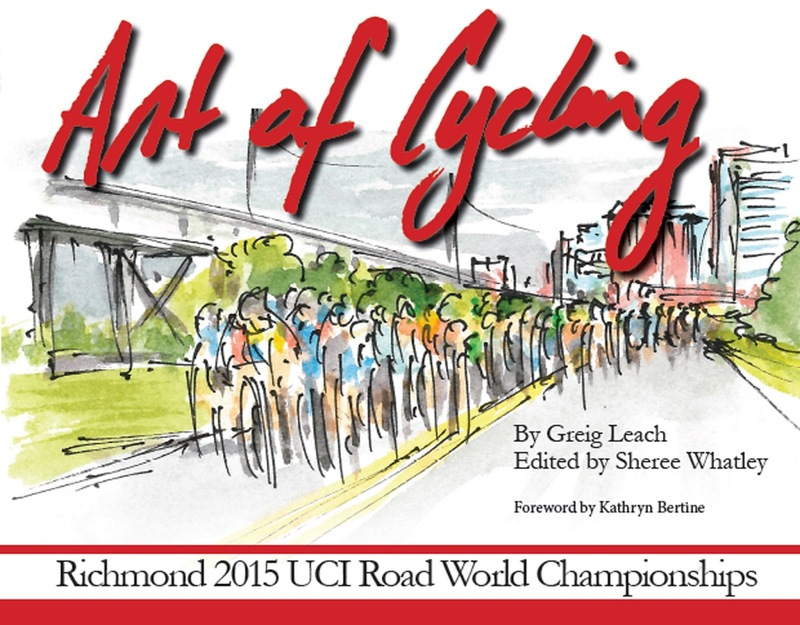 Plus, please be sure to check out my newest book, Art of Cycling: Richmond 2015 UCI Road World Championships. The book is complied from my live paintings of the 2015 Championships here in my hometown of Richmond, Virginia along with my blogposts serving as the rough draft for the text of the book. Greg Van Avermaet (BMC) managed to claim the overall lead by just beating out Peter Sagan (Tinkoff) at the line in Stage 6. His victory gave him bonus seconds leaving him 8 seconds ahead of Sagan and 7 seconds ahead of the previous race leader, Zdenek Stybar (Etixx-Quickstep). The short 10 kilometer course made it possible for the Slovakian sprinter, Sagan, to have a legitimate chance of beating the Belgium rider for BMC. Van Avermaet would have the advantage of knowing the time splits of Sagan who had left this start gate four minutes earlier. In the end, Sagan's ride was almost enough but Van Avermaet ceded only 7 seconds to the reigning Road World Champion, Sagan. 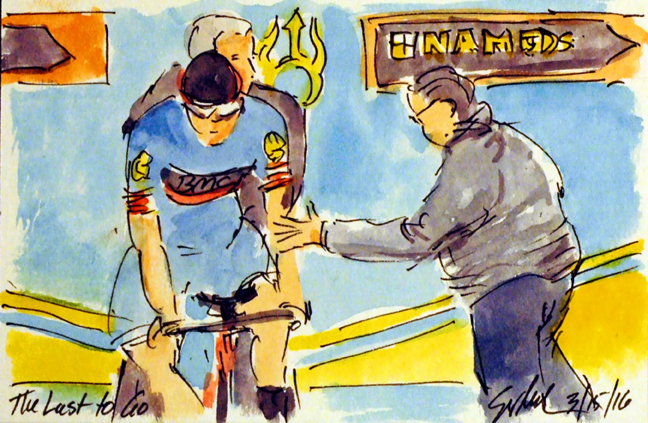 So as he crossed the line, Van Avermaet knew he had won Tirreno-Adriatico. Jean Christophe Peraud (Ag2r La Mondiale) rode a hard time trial, although not fast enough to move himself up on the general classification. As he approached the final couple of hundred meters of the course, the foreshortening of the camera made it appear as though he was drafting off of the police motorcycling that was ensuring that no one was in his way. 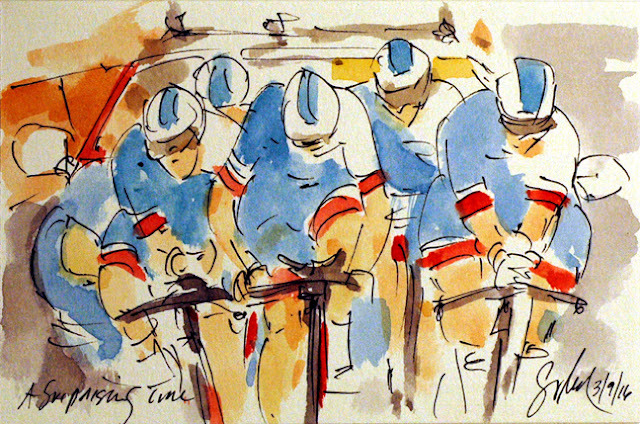 Peraud represents the renaissance of French cycling, one that has been further glorified by the stellar team time trial of FDJ to start Tirreno-Adriatico. Fabian Cancellara (Trek-Segafredo) hit the line 13 seconds faster than the previous best set by Johan Le Bon (FDJ) just nipping past a rider who had started two minutes before him. The Swiss rider had thrown down the gauntlet that few who even dare to pick up. Cancellara's over all time meant that he had little chance of upsetting the overall classification, but it had to feel good to take out the final stage of Tirreno-Adriatico. Fabian Cancellara (Trek-Segafredo) came out of the start gate on fire in the last stage of the Tirreno-Adriatico. Cancellara is a specialist in the short individual time trial, having started many Tours de France in Yellow due to his speed in the Prologue TTs. This may well be his final season and he obviously wants to go out with a spectacular year. With just under a kilometer to go, he is passing Sonny Colbrelli (Bardiani CSF) who had started the 10 kilometer course a minute ahead of the Swiss rider. Just up the road is the man who had started a minute ahead of Colbrelli. Peter Sagan (Tinkoff) resplendent in his Maglia Rosso, lead the quartet from the moment he launched his sprint, only to be caught at the line by Greg Van Avermaet (BMC). 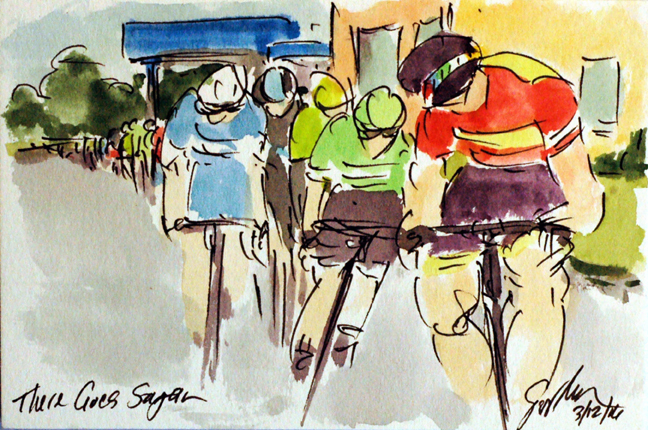 The two have been going at in this early spring and I am quite sure that Sagan is getting sick of Van Avermaet continually getting the better of him. Unable to stay with the two, Michal Kwiatkowski (Team Sky) held on for third while Zdenek Stybar (Etixx-Quickstep) missed the podium altogether. In so doing, Van Avermaet's win, with its bonus seconds added to the bonus seconds he gained out on course, moved the Belgium rider into the Maglia Azurra of race leader. With just an individual time trial left to race, it will remain to be seen if Van Avermaet can recover enough to ride a really fast 10k ITT. Peter Sagan (Tinkoff), the current World Champion, swung out of the slipstream of the former World Champion, Michal Kwiatkowski (Team Sky), and drove for the line. Reacting just a pedal stroke or two slower is the man whose attack lead to his counterattack that won him the World title was Greg Van Avermaet (BMC); The fourth man in the very select group was race leader, Zdenek Stybar (Etixx-Quickstep). 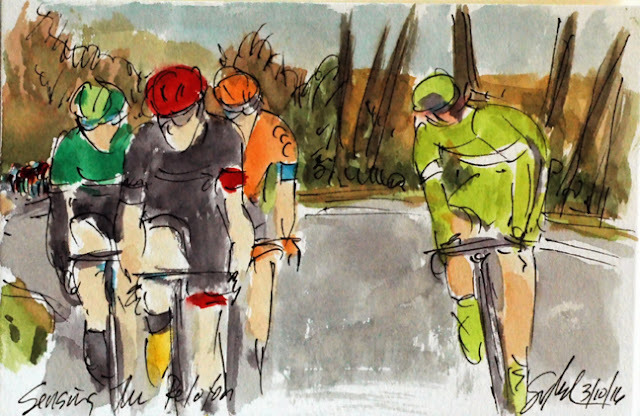 He was keeping a close eye on affairs knowing that with the cancellation of the mountainous Stage 5 due to snow mere seconds separated his lead from those of his break away companions. With just eight kilometers left in the sixth stage (the final road stage), Peter Sagan (Tinkoff) was in a powerful position. He had a 20 second lead on most of the peloton and had two teammates, Oscar Gatto and Daniele Bennati in the break with him. However, he wasn't the only one with two teammates alongside. Race leader, Zdenek Stybar (Etixx-Quickstep) had two men in blue at his side, previous stage winner, Fernando Gaviria, and Matteo Trentin. The other two managing to connect to this elite escapees, were the former World Champioin, Michal Kwiatkowski (Etixx-Quickstep) and the man second overall, Greg Van Avermaet (BMC). It was beginning to look like the stage winner was going to come from this group. 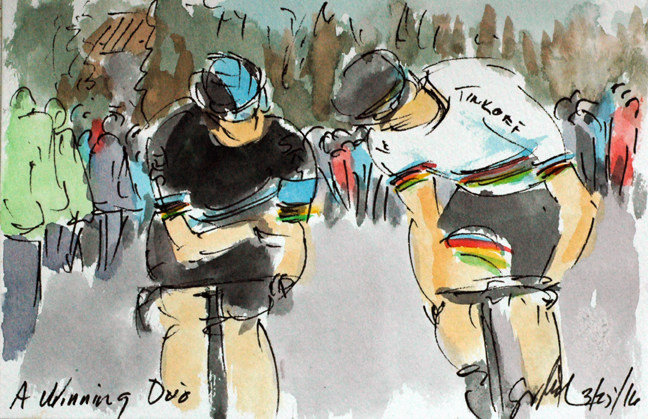 Sagan's teammate, Gatto, reached out to Sagan as the World Champion swung to the back of the group, perhaps to make sure the sprinter had enough to take the stage given the opportunity. Tirreno-Adriatico Stage 5: Who Is That? 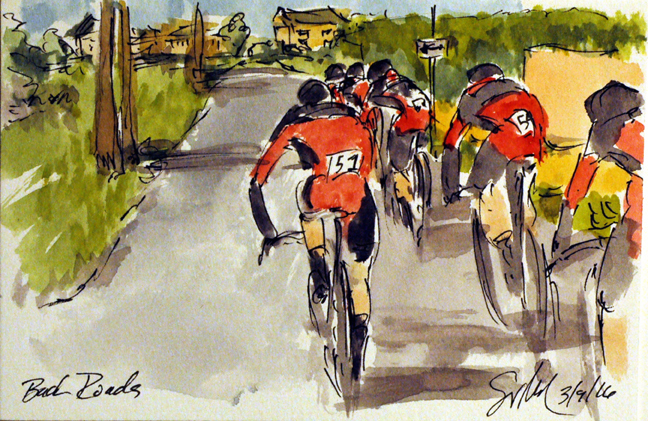 With a small, but powerful group up the road, the peloton set off in hot pursuit. The sprinters had pulled a sneaky move, after getting a gap going for the intermediate sprint, they kept riding (usually, they will sit up and wait for the peloton to come back together). The Eritrean National Champion, Natnael Berhane (Dimension Data) gave chase, hoping to set up another victory for the team. He had FDJ on his wheel. The men from FDJ looked over to see who in pale blue had jumped out from the group. The tricolore of the Italian colors should have told them that Vincenzo Nibali (Astana) had seen the danger of letting those up the road get too much of a lead. Peter Sagan (Tinkoff) traded in his rainbow jersey for the red of the points leader for Tirreno-Adriatico. With just an Individual Time Trial on the final day tomorrow, he was doing his best to ensure that he would take the overall Magila Rosso. Sagan and his teammates Daniele Bennati and Oscar Gatto sprinted out from the peloton to grab the points and bonus seconds at the intermediate sprint. Plus with the sprint line and the finish line being the same, it was a good chance to check out the finish and how they wanted to race it at the end of the stage in Cepagatti. Steve Cummings (Dimension Data) had been marking the attacks and hanging around with the escapees in support of his teammate, Edvald Boasson Hagen. When the group Cummings was with got to far ahead of the peloton containing Boasson Hagen, Cummings was free to ride for himself. And ride he did! 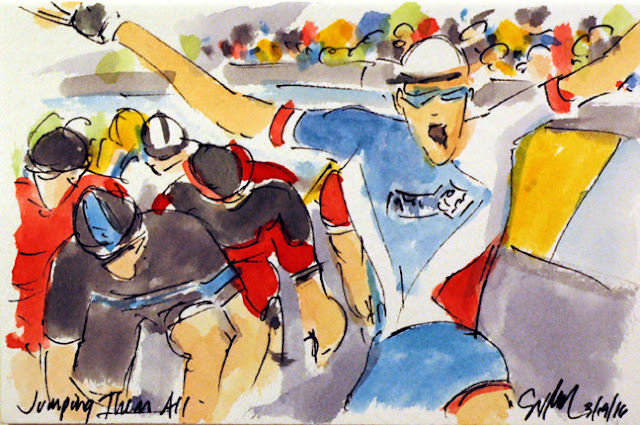 The Brit, after refusing to help those he had been with (at team orders), had the legs to ride everyone off of his wheel, taking an "absolute flyer" to the line for a solo victory in Foligno. This is a small original watercolor and ink painting that was created using Yarka St. Petersburg watercolors and Steve Quiller brushes from www.richesonart.com. This painting, and most of my cycling art, is available through my artist website at www.greigleach.com. To purchase this particular painting, just follow the direct link at the end of this post. And yes, international shipping is available. 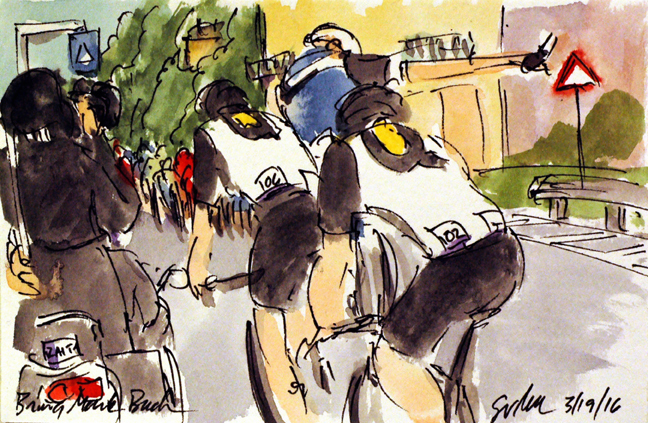 Plus, be sure to check out my newest book, "Art of Cycling: Richmond 2015 UCI Road World Championships" a complete telling of the 2015 Worlds through art and word painted live as the racing happened on the streets of my home town. Peter Sagan (Tinkoff) traded in his Rainbow Jersey for the Magila Rosso of points leader (a jersey he has won four times in a row at the Tour de France - although it is a different color there). Sagan tried to jump away from the peloton just as he did in Richmond but he didn't have the steep climbs and technical course to help him escape. 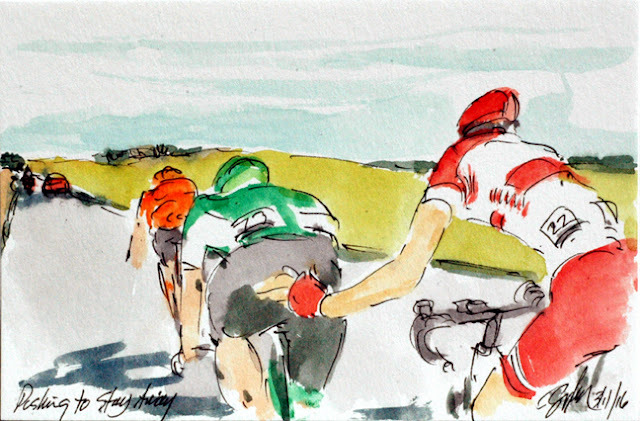 One of the many team tactics in a stage race is for teammates of the protected riders (or of high place riders on the GC) is to chase down threatening break aways or attacks. So when Mirko Selvaggi (Androni-Giocattoli) looked over his shoulder to check his gap on the peloton, he found Jakob Fulgsang (Astana) on his wheel. The duo was swiftly joined by Peter Kennaugh (Sky) and Steve Cummings (Dimension Data). All but Selvaggi were riding in support of teammates either to protect their general classification position or for their stage victory aspirations. 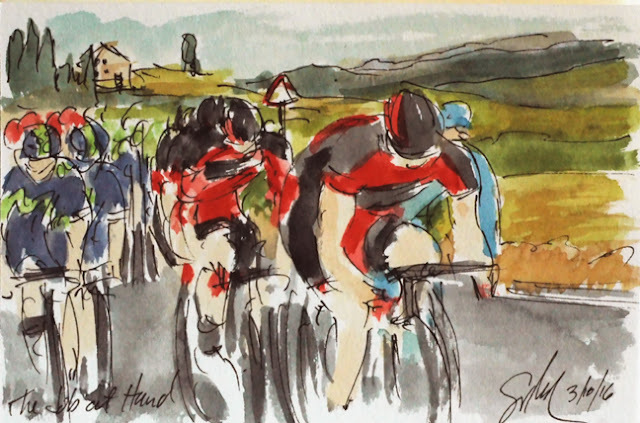 The peloton reeled in the early escapees on the circuit back to the base of the Montagna di Montefalco and then it was Fabian Cancellara (Trek-Segafredo) and his teammates that hit the front of the peloton. The Swiss powerhouse stormed up the climb to the picturesque Tuscan town dropping rider after rider off the back of the peloton. Waiting to his left is Greg Van Avermaet (BMC) and to his right, Vincenzo Nibali (Astana), neither wanting to let Trek-Segafredo ride away with the stage. Today's stage took the riders over the final climb of Montagna di Montefalco twice. On the first assent, the early break still had 3 minutes on the closing peloton, so Valerio Conti (Lampre Merida) saw his chance to grab some King of the Mountain Points. Leaving his other three break away companions, he sprinted off to the summit in hopes that he may still be away on the second trip up the climb. 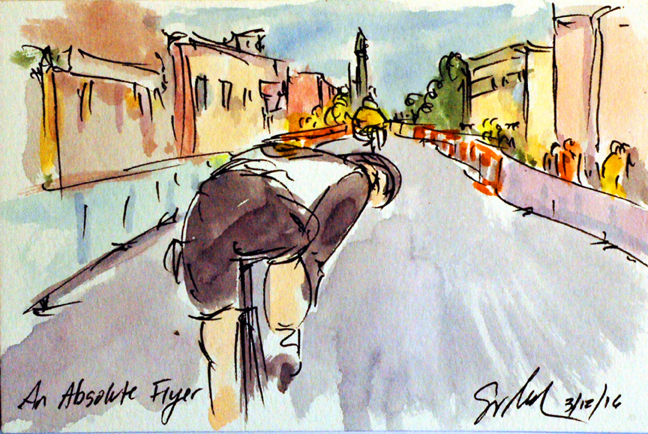 Cycling is a special sport for many reasons, with one being just how close fans can get to their bicycle mounted heroes, and without the price of an admission ticket. Fernando Gaviria Rendon (Etixx-Quickstep) did a great job paying the team back for all of its hard work on the road to Montalto di Castro. Just missing out on the stage victory was the rising star for Orica-GreenEdge, Caleb Ewan. Peter Sagan (Tinkoff) is still looking for a European victory in his snappy new Rainbow Jersey. Today he missed the podium, too. 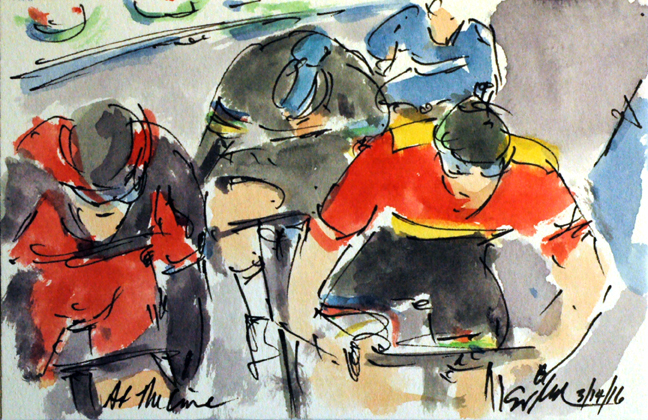 Others that made the painting, but not the podium, are Leigh Howard (IAM Cycling) and Sacha Modolo (Lampre Merida). Etixx-Quickstep also did enough to keep Zdenek Stybar in the Maglia Azurra of the race leader. This is a small original watercolor and ink painting that was created live using Yarka St. Petersburg watercolors and Steve Quiller brushes from www.richesonart.com. 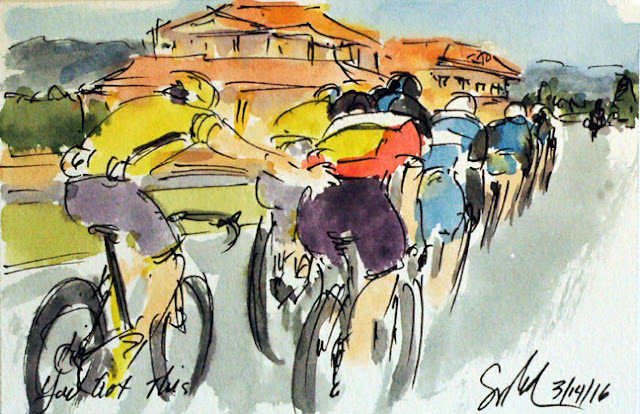 This painting is available through my artist website at www.greigleach.com, just follow the direct link at the end of this post to get your piece of Tirreno-Adriatico. Plus be sure to discover my new book, "Art of Cycling: Richmond 2015 UCI Road World Championships". 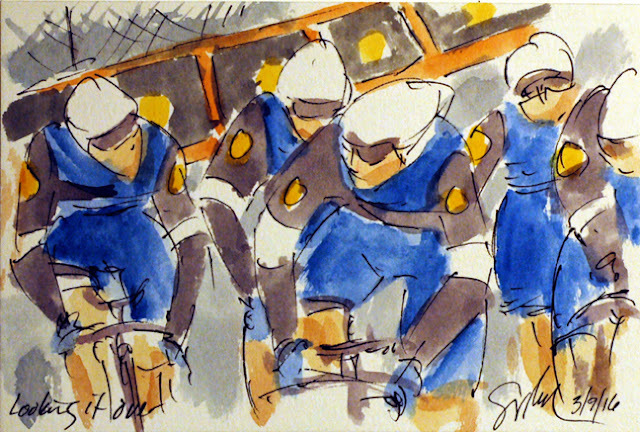 You can purchase it online at www.artofcycling.bike or ask for it at your local bookstore. The peloton did not want to catch the break too early. 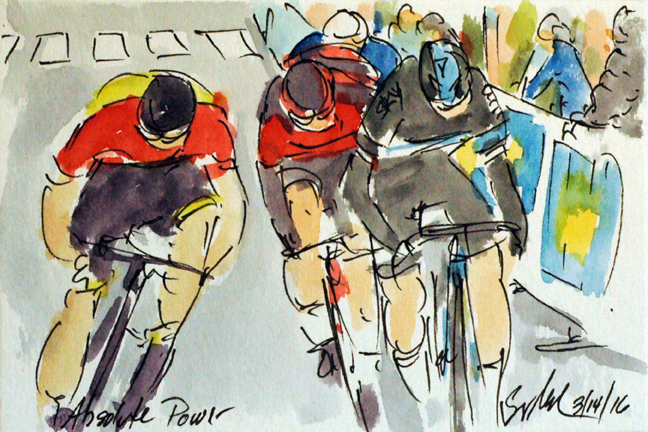 For the sprinter's teams it would mean they had to work that much harder to control the front of the group, to keep other opportunists from attacking off of the front. As they rolled under the 10 K banner, Etixx-Quickstep had all of their train together, the question was, were they setting up their sprinter or just protecting the Maglia Azzura of Zdenek Stybar? Riding in the second train was Orica-GreenEdge undoubtedly setting up their youn fast man, Caleb Ewan. 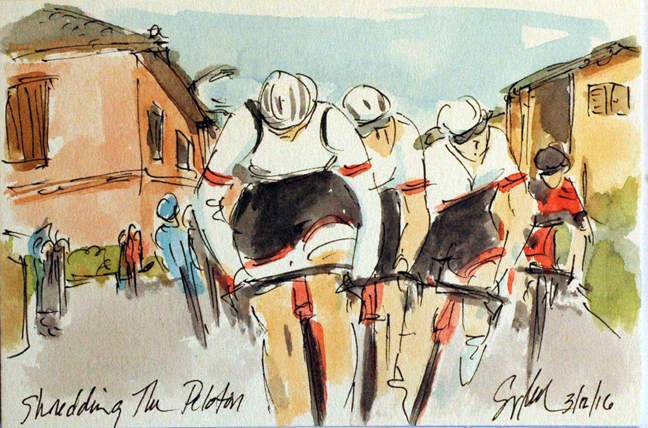 Never one to resist a good pun (defined by the groan it produces), the quartet of the early break were pushing themselves as hard as they could to keep away from the fast approaching peloton. 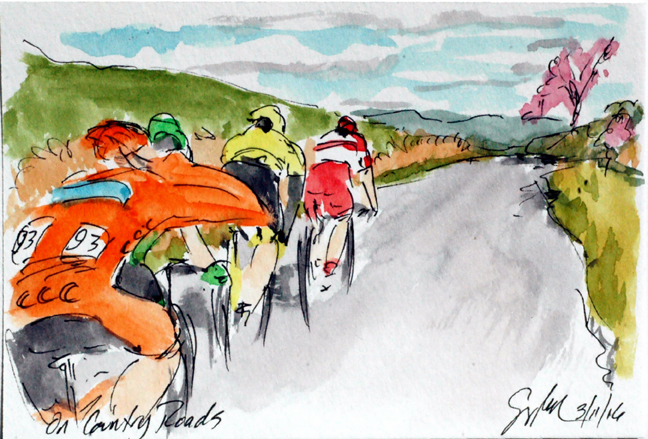 They had just 12 kilometers left to race, but the peloton could almost see them on the long straight roads on the way into Montalto di Castro. Giorgio Cecchinel (Androni Gattoli) gave Domingos Concalves (Caja Rural) a little push forward in line, skipping a turn at the front hoping to safe a little energy for the finale. 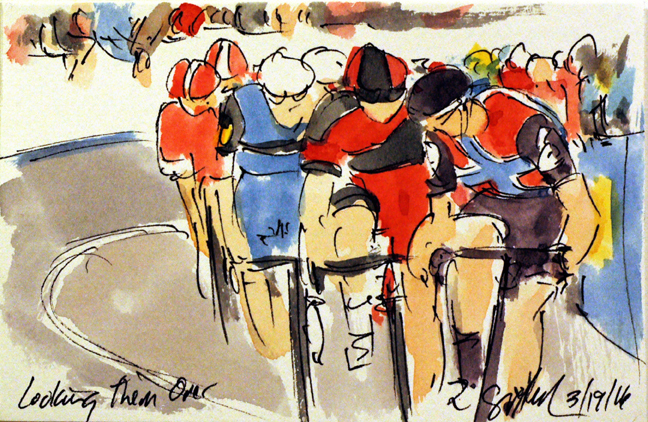 I know some people who watch cycling on television more as a travelogue than as a sporting event. This race from sea to sea in the early spring certain has its share of geographic beauty, although I don't think this quartet had much energy left for enjoying the view. By this point in the stage, the peloton had peg Adrian Honkisz (CCC Sprandi), Domingos Goncalves (Caja Rural), Davide Villella (Cannondale), and Giorgio Cecchinel (Androni Giocattoli) at a manageable 3 minutes. 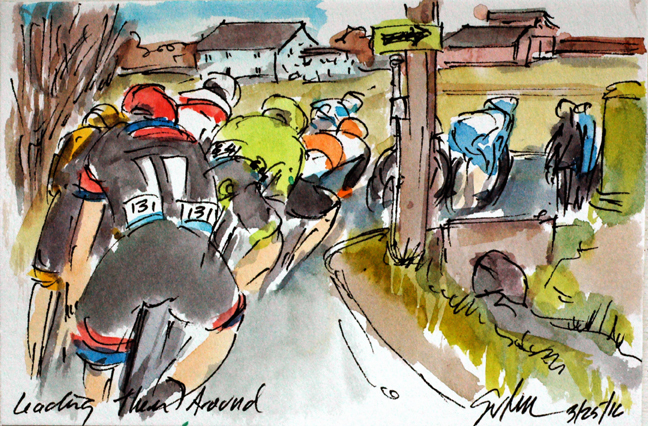 With 45 kilometer left of the 176 kilometer stage, there was plenty of time to reel the escapees back into the peloton. The early break knew it would be the ones picking up all of the intermediate sprint points and the King of the Mountain points, so it was Domingos Goncalves (Caja Rural) who first got the jump on the others in the break, but it was the power of Davide Villella (Cannondale) who claimed maximum points on the top of Scansano. Tirreno-Adriatico Stage 3: Can You Fix It? A ProTour team is not just the guys on the bicycles, it includes a huge crowd of support personnel. Perhaps one of the most important is the mechanic that rides in the team car, who can fix anything that goes wrong while the car and the bike are rolling along at over 40 kph. 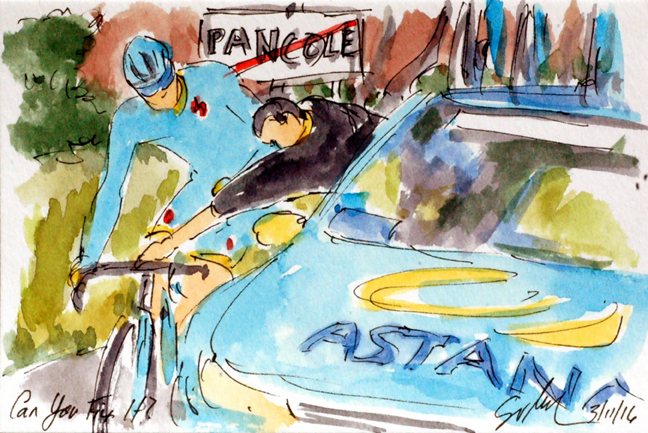 I am thinking that this is Gatis Smukulis (Astana) who has dropped back to see what is wrong with his derailleurs. It isn't much fun being stuck in a hard gear on a climb. Ultimately, the decision was to swap bikes and deal with the problem at the end of the stage. I should tell you that I am now watching this race using RAI-TV's web broadcast, which has been great with the small exception of being in Italian - not a language that I am exactly fluent in. That being said, the presenters were very excited with the attack by Giovanni Visconti (Movistar) but where going totally crazy when Vincenzo Nibali (Astana) countered Visconti's move bedecked in the tricolore of the Italian National Champion's Jersey. However, it was the late move with just over two kilometers left by the former Czech National Champion, Zdenek Stybar (Etixx-Quicstep) that proved the be the well timed strong escape of the day. Nibali wasn't able to chase down the fleeing Czech, nor could the reigning Slovak and World Champion, Peter Sagan. Sagan managed to claim second on the day, but seems to be finding victory in the Rainbow Jersey a bit elusive. Stybar's stage victory was enough to move him into the Maglia Azurro of race leader, with Tejay van Garderen (BMC) a mere nine seconds back (tied with a number of his teammates). This is a small original watercolor and ink painting that was created using Yarka St. Petersburg watercolors and Steve Quiller brushes from www.richesonart.com. This painting is available through my artist website at www.greigleach.com. To purchase this painting just follow the direct link at the end of this post. In addition, be sure to check out my newest cycling art book of the Richmond 2015 UCI Road World Championships at www.artofcycling.bike. With all of the early break back in the peloton (or out the back after the long effort), it was time for the opportunist to start the attacks. One of the first to go was the Italian, Giovanni Visconti, riding for the Spanish team, Movistar. Behind him one of the men from AG2R La Mondiale tried to cover the move while behind him, BMC kept stamping out the rhythm. With just 5 kilometers left to race, it was possible to hold off the peloton if you time the move just right. Unfortunately for Visconti, his move was pulled back just a kilometer or two up the road. 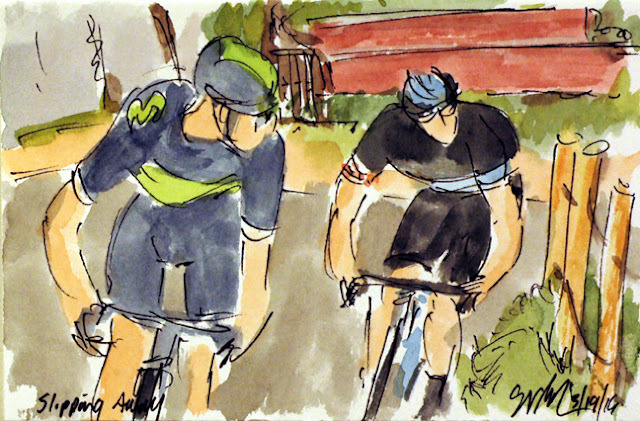 Two of the members of the early break had already succumbed to the work of BMC, Team Sky, and lately, AG2R La Mondiale, Simone Andreetta (Bardiani CSF) looked over his shoulder to see just how close the peloton was to pulling himself, Cesare Benedetti (Bora-Argon 18), Nikolay Mihaylov (CCC Sprandi) and Luis Mas Bonet (Caja Rural) back into the fold. With only 12 kilometers left to the finish, it must have been to see the multi colored peloton just meters behind after nearly 200 kilometers of racing. The early break had gained over six minutes on the peloton so it was up to the team of the Magila Azurra, BMC, to go in search of the escapees. With the beautiful country side to entertain their eyes, BMC worked tirelessly to bring the six back, with twenty kilometers left to ride those up the road had just over a minute on the American team. 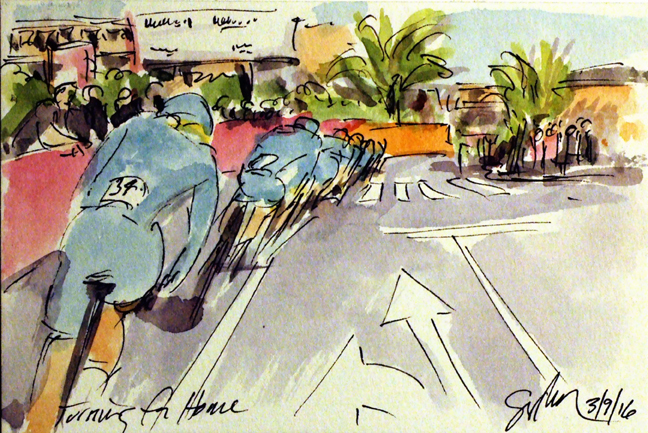 Riding in the shadow, or more accurately, in the slipstream, were the teams of Movistar, Astana and Bora-Argon 18. It is almost an unwritten rule that the wild card teams must go on the attack in any race that they have an invitation to participate in. The only ProTour team rider in the early break in stage 2 of Tirreno Adriatico was Frederico Zurlo of Lampre-Merida. Join him were riders from four of the wild card teams including, Giorgio Cecchinel (Androni-Giacattoli-Spidermec), Nkolay Mikoylov (CCC Sprandi Polkowice), Simone Andreetta (Bariani CSF), Cesare Benedetti (Bora-Argon 18). And attacking them all on the climb up to the summit of Monterotondo Marittimo was Luis Mas Bonet (Caja Rural - Sefuros RGA). Alas, his attack was for naught as he was caught at the summite by Zurlo. With slightly better results than Katusha, Astana was riding to keep their leader and former winner of all three grand tours, Vincenzo Nibali, in close contact with the top of the general classification. 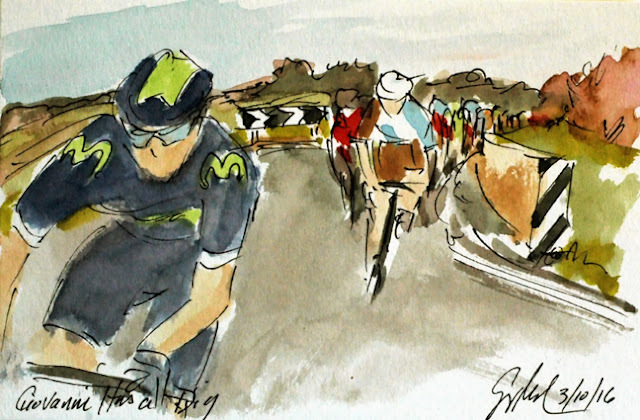 With less than a kilometer left to the line, Nibali's faithful lieutenant, Jakob Fuglsang, is tacked onto the back of the line of teammates having done his share to keep the team flying to the finish. This is a small original watercolor and ink painting that was created using Yarka St. Petersburg watercolors and Steve Quiller brushes from www.richesonart.com. 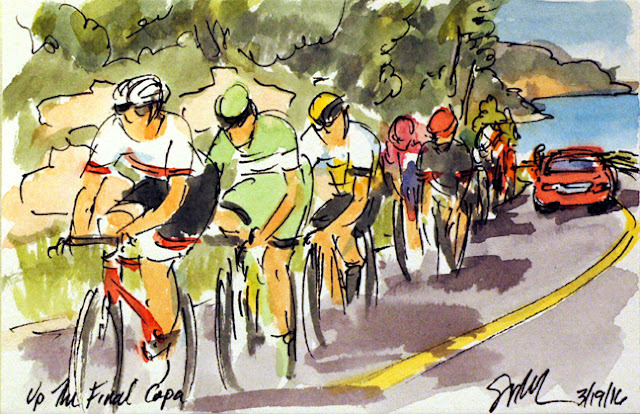 In addition this painting and all of my cycling art, is available for purchase through my artist website at www.greigleach.com. And yes, international shipping is available. 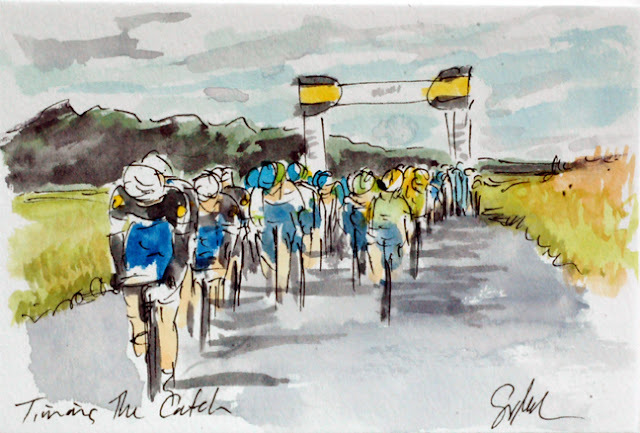 Just follow the direct link at the end of this post to get your piece of artwork of the Tirreno-Adriatico. 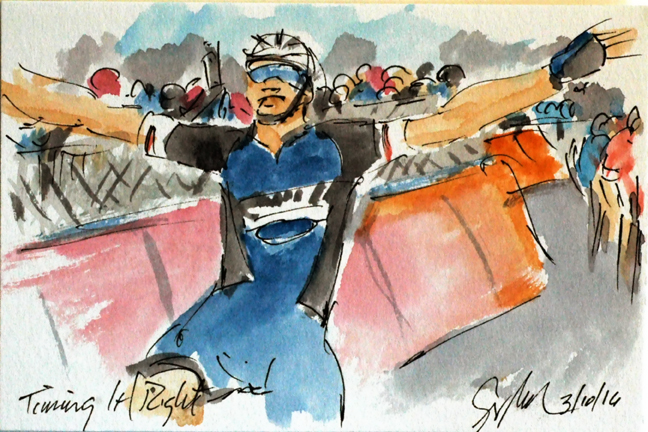 Be sure to look up my recently published book, "Art of Cycling: Richmond 2015 UCI Road World Championships" You can purchase your copy online at www.artofcycling.bike or ask for it at your local bookstore. BMC Pro Cycling is currently the two-time reigning champions in the Team Time Trial although not all of this group where in Richmond, Virginia when they took the title. 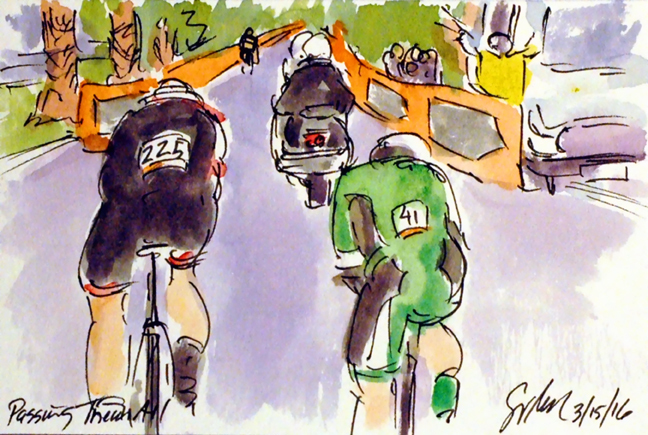 Tejay van Garderen, the team leader, is slipping off of the front and preparing to slide in behind Alessandro De Marchi and Jean Pierre Drucker. BMC was able to claim the stage and put the Italian, Daniel Oss, into the leader's Blue Jersey. Etixx-Quickstep has brought a powerful team to the race across Italy. They managed to take over first place on the leader board with just a few teams behind them. Unfortunately for Gianluca Brambilla and his teammates, one of those team is the reigning World Team Time Trial Champions, BMC. At this moment however, Brambilla has the virtual leader's jersey. Team Katusha is sporting a new kit for the 2016 season and I think it is one of the better looking outfits in this year's peloton. Katusha had high hopes for their team leader, Joaquin Rodriquez, so they were doing their best to keep him high up on the general classification. 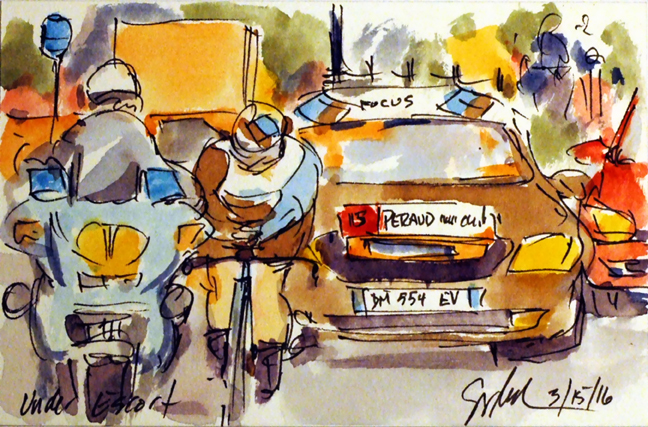 I have painted the Paris-Nice race for several years, so I decided it was time for a change. I am sure those who are riding in Tirreno-Adriatico are pleased to be missing the snows that fell on stage 3 of the Race to the Sun. T-A got underway with a Team Time Trial and saw Johan Le Bon lead is FDJ team across the line to claim a surprising early lead in the race. 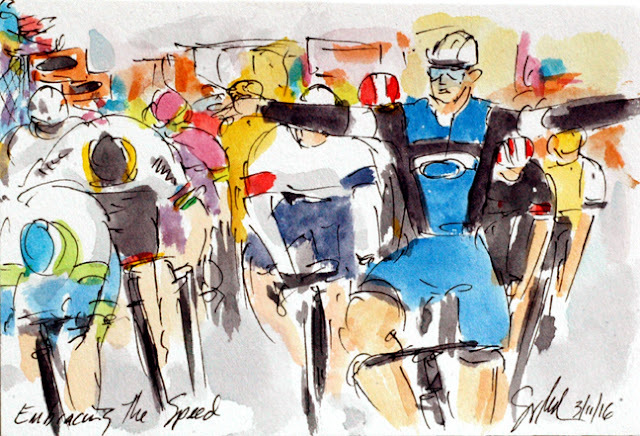 The first man to cross the line on the winning team would also be the first to wear the Blue Jersey of race leader. This is a small original watercolor and ink painting that was created using Yarka St. Petersburg watercolors and Steve Quiller brushes from www.richesonart.com. In addition this painting and all of my cycling art, is available for purchase through my artist website at www.greigleach.com. And yes, international shipping is available. 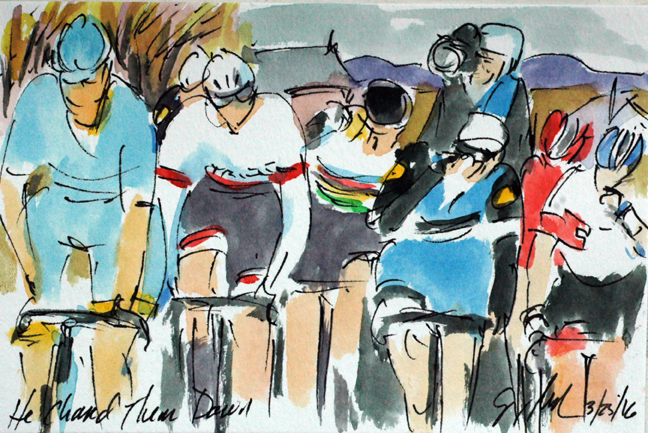 Just follow the direct link at the end of this post to get your piece of artwork of the Tirremo-Adriatico.